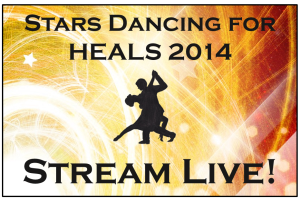 Stars Dancing for HEALS 2014 - Stream the event LIVE! - HEALS, Inc. This year we have a wonderful alternative to the sold out show! You can stream the Stars Dancing for HEALS event LIVE in the comfort of your own home or even on-the-go with your mobile device. You only need a wireless or data connection. The live-stream will be available on Monday, November 3rd from 5:30 – 8pm. Dancing begins promptly at 6pm, so get online early with your popcorn and beverage of choice! Streaming live means you will have access to all the fancy moves, stylish costumes, and the enjoyment of watching your favorite Star dance LIVE! Plus, there is an option to cheer on your favorite dancers in the comments section of the live-stream. You can even chat with other viewers and team up for your favorite dance! Don’t forget to vote by donating online until 7pm that night and support the Star or dance of your choice! Every dollar is a vote for your favorite Star. We can’t wait to see you online this Monday evening!